Tested on Wings Over Vietnam Oct '08 patch. View the readme for details. Have fun! Any pics of this skin? And I just see that you're from Indonesia. I have a wife and daughter in Sumatra, Medan. Where do you live in Indonesia? I live both in Europe and Medan. 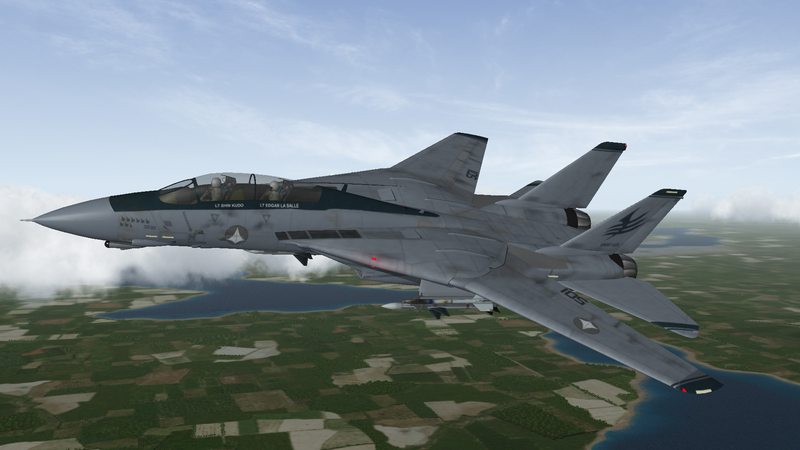 Well, Heatblur finally released the F-14B into Early Access. If you aren't familiar with DCS, you may like to know that you need to run the module in the DCS World OpenBeta, rather than the full-up version. I hadn't touched OpenBeta and only played DCS every now and again in the past, so I was glad to find that out. I'm quite impressed with the module to say the least. The Jester AI is easy as pie to interact with, making long-range engagements very straightforward. I did three sorties tonight, after a control shakeout (DCS likes to assign axes to everything!) and basic familiarization flight. The first mission I forgot to set the time to 1200 and left it on "Random". So, a pitch-black fight against a MiG-21 it was! I have the tags on, still, in part because the monitor can slip out of my glasses field of view with TrackIR, and I can at least see a little red blob against the terrain, so that helped, but it does feel like cheating and I'll be shutting it off at some point. I was able to down the Fishbed and get back to base. Second fight was in Nevada doing long-range stuff to check out Phoenix. The final fight was the included "MiG-28" fight, which was a 4v2 which sees you take a catapult shot and bring the plane back to land. Because we had an E-2 in the area, we got a vector for the bandits, ROE was splash anything that went feet-wet. I still haven't figured out how to direct the wingman, so he was effectively along for the ride. At about 25NM, TWS-A selected, I loosed both AIM-54Cs at a MiG-28 a piece, both missiles tracked and splashed their targets. Next bandit I got with my second Sparrow missile. The final guy got a shot off at my wingman, but his missile took dash-2's flares. Both AIM-9 shots I took were trashed and I had to finish him off with the gun. Plenty of gas left, but now I know I've gotta put it down on the boat, and man am I glad I went straight home, because I think it took me about 10 tries to get back on deck, and that last try, let me tell you - one of those famous "we land NOW, GOD-DAMMIT!" one-wires where I just barely missed a ramp strike. Wasn't pretty and I know I damaged the plane because little holes appeared on the port-side of the nose of the model to signify that the section had taken a beating. Funny enough, in combat, I only put 6.8g on the plane! No kill like a GUNS kill! I think it would come as the understatement of the century to say I was anticipating this module, but I will also say that until Heatblur did their official announcement video, I had zero confidence it would ever get done. The DCS community has been burned plenty of times in the past, and HB had run into problems and setbacks of their own while in development. My mindset became: once it's on my hard drive, then I'll believe it. As videos began to roll in, however, it became more like a kid on Christmas "oh man, I can't wait." Well, now I have it, and I can share some first impressions. The model is friggin' fantastic. The level of detail on it is stunning both externally and in the cockpit. The rivet-counters will have a tough time on this one; the models are based on laser-scanned F-14s sitting in museums, and years worth of research. The sounds are also amazing, to include a lot of clickyness to the various buttons and switches in the cockpit. The view out of the cockpit is very good, as one would expect out of a bubble canopy, but not as good in the forward quarter as an airplane without the "jail bars" splitting the windscreen. That said, with TrackIR or VR, you can simply move your head a little, or lean forward or back to keep tally. You can see clear through the tails from the front seat. In this case, I just started flying through a cloud, so it's a little blurry. The Jester AI, like I mentioned earlier, is very intuitive and easy to interact with. Even without reading the manual on how to interact, I figured it out in the first combat flight I took. The single biggest thing that will take time to learn is the flight model and handling characteristics. The F-14 is truly a stick and rudder plane, and the F-14s in Strike Fighters 2 don't even come close to simulating the adverse elements of the F-14's handling, especially wing rock and control reversal. I wouldn't consider myself a contender online at the moment, and the fact that I was able to take out the AI aircraft in a gunfight at this stage is simply because they are AI. If you hop in expecting the plane to hold your hand like the F/A-18C module, you're in for a ride. It has no g-limiter, no alpha limiter, beta (yaw) limiter, etc. It's you talking directly to the control surfaces and them doing whatever the hell you tell them to, be it to your advantage or detriment. "Need to get out of the way of that missile and put the stick in your lap? Fine! 10g ain't the worst I've been through! Boot full of rudder? I'm not stopping you! Canopy jettison followed by...oh, you son of a..."
In terms of overall maneuverability (sustained/instantaneous "g", roll rate, etc.) the airplane feels good. If I didn't jack it up and start rocking the wings, I was able to turn perfectly fine and loaded as much as 9.8g on the plane in one of my fights without complaint. A major saving grace against the F-5s when I got the plane out of shape is the fact that the B adds energy quick, and I was able to stabilize the plane and quickly curl inside their turns to go from defensive, to neutral, to offensive reliably and repeatedly. I actually had to get one of them off of my dead six o'clock (he shot a missile while there, but it took my flares) and was able to reverse the situation in a manner of seconds. The F110's power also gives the plane a lot of options, such as pushing the fight vertical, or un-f*cking your carrier approach when you jack it up and almost put yourself into the back of the boat for the fourth time. AoA and airspeed are very important to pay attention to, and the rudders will make or break you in a dogfight or at slow speeds. I still haven't felt out the slow speed regime intentionally yet. I have run the plane out of airspeed during some hamfisted dogfighting moments, but honestly, it recovers itself pretty quickly, and it maintains a degree of controllability even below 100KIAS, such that I was able to point the nose where I wanted with the rudders as the plane flopped over and began regaining speed. It also allows you to go to full flaps for slow-speed flight/fighting without needing to pull the aux flap circuit breaker (of the few things not [yet] modeled, one is the circuit breakers). As I build confidence, I'll start looking to test my skills against MiG-29s, Su-27s, etc., and eventually get into multiplayer, but right now, I'm still learning the thing. Overall, it's a really amazing module. Every video I've seen talking about this module says that Heatblur set a new bar for aircraft in DCS. I agree. The plane is spectacular. You'll need to put in the time to learn it, but man, is it rewarding to fly. At some point in the future, the F-14A will be released, and the package already comes with a carrier and A-6, so its steeper asking price of $79.99 gets you more than just a single jet. In my opinion, it's well worth the asking price. Regardless if a product has just been released, is already on sale or in pre-purchase, you will always earn ED Miles on the price you paid for the purchase. For each purchase, you will earn 10% of the Purchase Price in ED Miles. As an example: if you purchase something for USD 29.99 you will be awarded 2990 ED Miles worth USD 2.99 on the DCS World e-Shop. You can use ED Miles to purchase any product participating in the program, regardless if they are just released, already on sale, or as a pre-purchase! There is no limit on the number of ED Miles you can use for a purchase. If you have enough ED Miles, you can even pay for an entire product just using ED Miles. ED Miles earned are valid for three calendar years from the time of your last DCS World e-Shop purchase. Existing Bonus points will expire in 2019 on a date to be confirmed. Note that ED Miles cannot be redeemed for cash or any other conversion, and a list of 3rd parties participating in the program will be provided at launch. The Christen Eagle II by Magnitude 3 LLC is now available on Steam.